The beach she was on is Hawaii's most dangerous for spinal-cord injuries. It was supposed to be a dream wedding. Instead, for Nikki and Will Lewis, their honeymoon in Hawaii turned into a nightmare when a monster wave crashed onto Nikki and left her paralyzed. The newlyweds were bodyboarding on Maui's Big Beach, in Makena State Park, a few days after their wedding earlier this month, when the wave, at least 6 feet high, slammed her into the ground and engulfed her completely, JaMikal Moorer, one of her best friends, told ABC News. "I lost sight of her for a good bit," said Moorer, who was watching, aghast, from the beach. "It was probably five to 10 seconds, but it felt like time had stood still. I was saying in my head, 'Get up, get up.' Once the water receded, we saw her lying headfirst in the sand with her body kind of crunched up and the water flowing over her body." Will rushed to her aid, as did Moorer, another friend, and a bystander who happened to be a paramedic. They brought her out of the water, trying to keep her neck straight, but her spine was already broken in two places and she couldn't move or speak. "You could just tell her eyes were asking for help," Moorer said. (Family Handout) Nikki Lewis appears in this photo posted by her husband, Will, to 'Nikki's Hope' Facebook page, Sept. 23, 2018. Later, when she was able to speak, Nikki would recount the helplessness and terror of those moments when she was lying on the ocean floor, unable to swim toward the surface or breathe, Will said. The beaches in Makena State Park have a reputation both enticing and menacing. They are popular with surfers and bodyboarders for their beauty and shore break, which creates big waves to ride on. But they are also the most dangerous among Hawaii's 48 beaches -- 22 people ended up in hospital from there with spinal-cord injuries between 2009 and 2013, more than at any other beach, according to Hawaii's Trauma Registry. 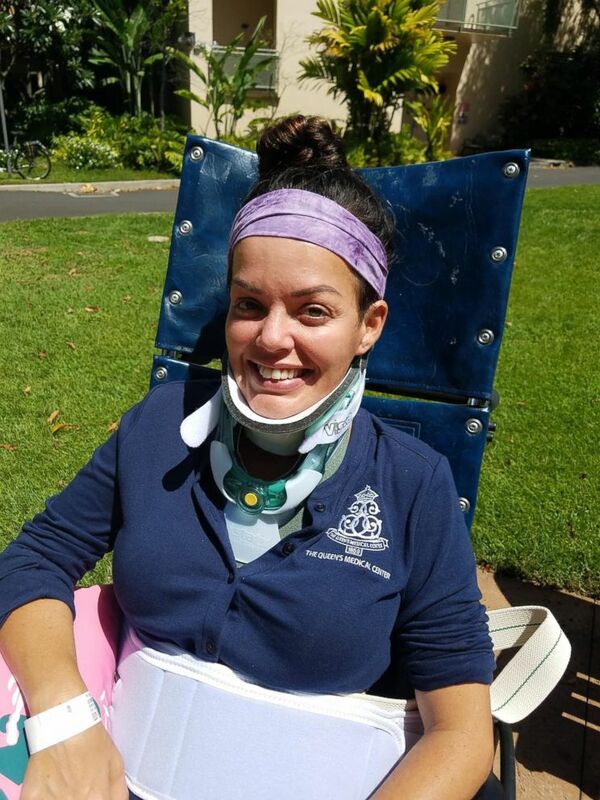 Nearly two weeks after her accident, Nikki remains in a hospital in Honolulu, slowly recovering movement in the extremities of her body and gaining strength in her legs. Her husband says he's thankful for the progress she's made -- most people with her injuries never make it off a respirator. 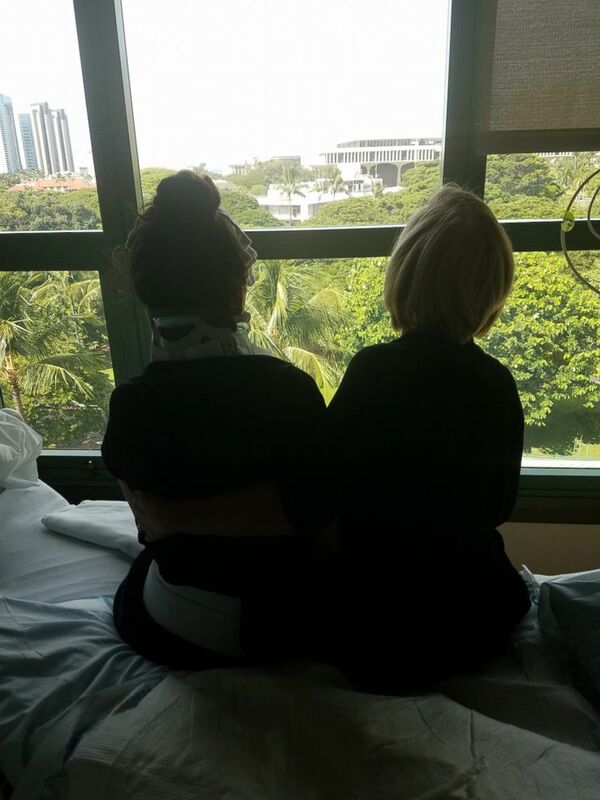 (Family Handout) Nikki Lewis sits with her mom, Kim Martinez, at the hospital in this photo posted to 'Nikki's Hope' Facebook page, Sept. 25, 2018. Nikki's family and friends are now trying to raise funds to help transport her home to Texas, where she can be cared for by loved ones and be reunited with the couple's three children. In photos and videos posted by her family on Facebook, despite being confined to a bed with her neck strapped in a brace, Nikki often smiles and laughs. "Her upbeat personality is what is getting us through it," Will said. "Don't get me wrong, there are lots of tears, but she's doing her best to recover, she's giving it her 100 percent. We both miss our kids and just want to be back with them."